Hello, for those of you that have been following this blog, you know that for the past six months it has been written by me, Katie, the Project World School intern. I have found so much joy in writing for this blog and working and learning from Project World School. But all good things must come to an end. I fly back to the United States in just one week. My internship is ending, but my time with PWS isn’t! I will be returning to Mexico to facilitate the Family Summit 2017 kids camp for a second year! So what will this kids camp look like? 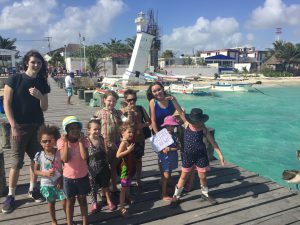 Last year, we hosted the camp in Puerto Morelos’ outdoor own square, and spent the days playing at the beach and under the sun. This year, we are in Merida, Mexico, further inland in the Peninsula. The kids camp is projected to be over three times as large as the year before, and we are very excited for this! The camp will be held in Merdia at Hotel Los Aluxes and will have both indoor and outdoor facilities and activities planned for the various ages of worldschoolers joining us. There will be a heavy focus on culture and the area we are in. 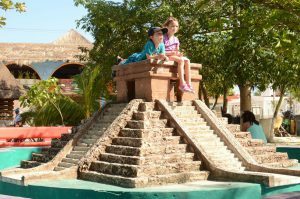 The crafts will focus on the history of the Yucatan and there will be dance workshops in Mayan, Aztec, and Folklorio dance available for the whole family! This is the perfect opportunity for your worldschooling child to be able to form a strong knit community with other worldschooling children while you do the same with the adults in the sessions. 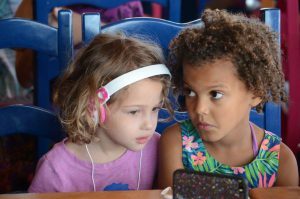 Children have come out of this program with deep, lasting friendships from the 3 days of play and adventure together in this environment. I can’t do this alone though. The kids camp is run off of teen and adolescent volunteers. In order for your children to be safely entertained while you participate in the sessions and workshops, we need a staff of responsible adolescents. We offer a discount on our Mexico Teen Retreat for any teen participant that will come the week early and volunteer with the kids camp. During this week, their food, accommodations, and travel expenses are all taken care of by Project World School. I am also looking to you, the families attending this amazing Worldschooling Summit, to urge your teens to work with us. This is an opportunity for them to bond with other worldschooling teens, add a purpose to their time in Mérida and release their inner child while getting to play again! Volunteering for this kids camp is a rewarding opportunity and one that will stick with them for years to come. So there it is, the rundown on the upcoming kids camp during the Project World School Family Summit 2017. What ages is kids camp for? Kids camp is for kids 5 and up! My girls Riley 14 and Remme 13 would be interested in volunteering. Let us know what we need to do next. Hi Jess, will you email me at katiemitchell81@gmail.com? As the summit becomes closer I will send out a mass email with all of the info volunteers need to know. I’m so excited to have them! Hi Katie! My daughter, Ella, is available to volunteer and help with the kids camp! She will be 15 by then and is great with kids of all ages. Please let me know how she can best connect with you. Thanks and we look forward to meeting you in Mexico! What is the age requirement for helping? My daughter Abbie will be 12 1/2 and she is the oldest of five, so she’s pretty capable with kids. 🙂 I have a feeling she’d love to do this. Hi! We would love to have her. She will probably be paired up with an older volunteer as well to make sure she doesn’t become overwhelmed! Hi! I have questions. We are trying to figure out our dates. I think we will have to fly back home Thursday the 6th and was wondering if we may be able to include our daughter in the camp. Do you know which three days will the camp take place during the summit? And, is there an extra charge for the camp or is it included with the general fee? We will most likely stay at another location in Merida near the hotel, what time will the camp start? Also, what do they do for food? Thanks so much. Hi, our oldest son is 4 and will turn 5 in June, could he still join the kids club?